The sentencing of Azhar Ahmed to 240 hours of community service for posting on Facebook the comment ‘All soldiers should die and go to hell’ is a new low for British democracy. The triple whammy is Islamophobic, anti-pacificist, and anti-freedom of speech. Ahmed certainly overstepped the mark in posting the comment among a series of tributes to six soldiers who had died in Afghanistan a few days previously on Mar 8 of this year. However, a 20-year-old Muslim who obviously does not approve of Britain’s 21st century war exploits should not have been criminalised over a genuinely political comment which he later deleted. The post is an anti-war diatribe which rightly compares and contrasts the grief of British mothers with atrocities being committed by British soldiers on innocent people in Afghanistan. Its language is typical of that of young men of his age but its message is a timeless protest against military imperialism. (William Blake once stood in the dock accused of saying to a soldier ‘Damn the king and all his subjects. All you soldiers shall be sold for slaves.’ Thankfully, for British art and poetry, Blake was exonerated. He would never have damned ‘all his subjects’ but might well have damned the King and his armed forces, as he was a rabid Republican and pacifist). 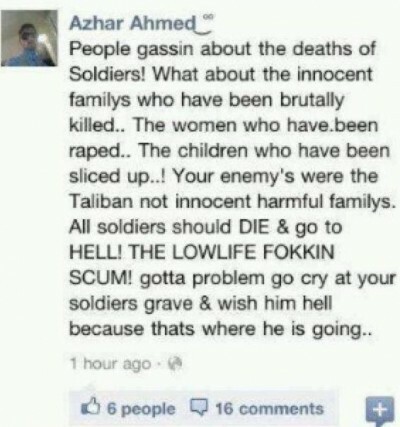 Azhar Ahmed’s arrest came after one of the mothers of the dead soldiers saw the comment and called the police. Judge Goodwin later added insult to injury when she said the verdict should not stop other people from voicing political opinions. The mediocrity of her court was finally compounded by fining the young man £300 – on top of his community service – showing British law not only to be racist, militarist, censorious, but money-grubbing to boot. This entry was posted on 10 October, 2012 in homepage and tagged All soldiers should die and go to hell, anti-freedom of speech law, anti-pacficist law, Azhar Ahmed, Islamophobic law, Judge Jane Goodwin. Bookmark the permalink.